There are currently a larger amount of scammers out there in a variety of forms- email, phone, internet, text, mail. We have been advised by the Australian Taxation Office (ATO) that some scammers are currently calling pretending to be from the ATO to try to get personal details. If you receive such a phone call, please DO NOT GIVE OUT YOUR TAX FILE NUMBER, BANK ACCOUNT DETAILS or any other personal information. If the ATO does call you they do not identify you by asking you your Tax File Number or Bank Account details. If you are unsure if it is the ATO calling you or a scammer, ask them what the “issue” is regarding and ask them to put it in writing. Contact us and we will contact the ATO on your behalf to find out if it was a genuine call or a scam. 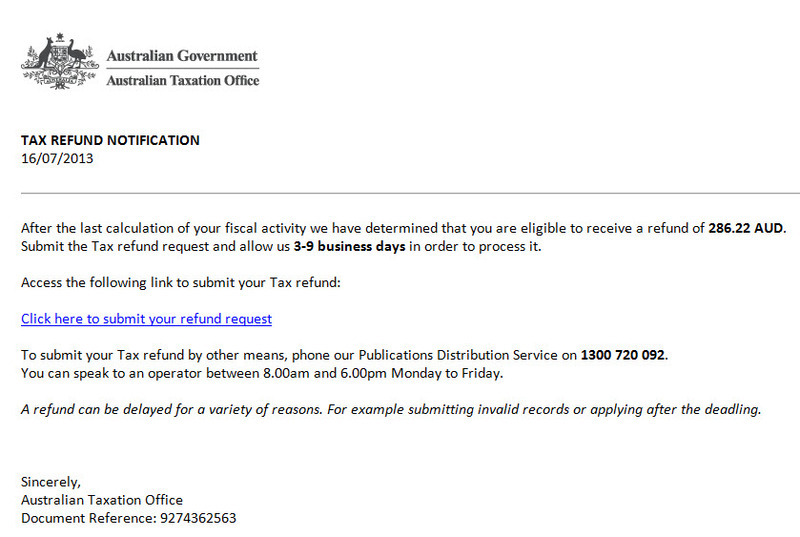 The following images is a screenshot of an ATO scan that is currently being issued via email. THIS IS A SCAM, do not click on any links. I you are suspicious, please contact us.